Previously on The Totality, I published a preview of the forthcoming Asia House Film Festival. Over the next two weeks I'll be following up the initial post with a number of reviews featuring some of the pan-Asian sights and sounds you can experience at the 8th annual Asia House Film Festival. We start today with a look at a selection of the short movies which take place throughout the festivities - thrillingly these comprise of an eclectic selection: from documentaries to animated whimsy, from Cantonese to Hindi, from the awe-inspiring to the shudder-inducing. Drama, a 2014 short directed by Tian Guan, is as minimalist a movie as one could imagine. Shot through a car wind-screen, the Cantonese-language film becomes an almost POV-piece of cinema as we witness, but do not hear, an argument (perhaps?) between two individuals we view from across the road. Narration is provided by a second bickering couple, a would-be amorous pair, who concoct their own story-lines of what the first duo are discussing from the parked automobile we, by way of the camera, also find ourselves in. If that sounds complicated on paper, on-screen Drama flows easily with engaging lucidity. 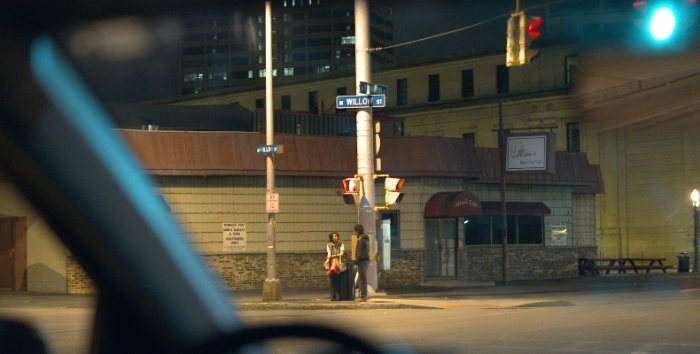 Guan's film's premise, technically simple but philosophically nuanced, transforms the audience into voyeurs twice over. We sneakily witness one couple's actions, yet we are also let into the inner-most thoughts of the second through the conversation we overhear. Whilst, nominally, the pair may be speaking of events which do not concern them, creating characters as they narrate their own silent film, what they say speaks more of themselves than the strangers they're watching. Despite barely seeing the duo we, the audience, share a cramped space with - their fleeting appearances are largely out of focus - we recognise something of ourselves in them through the intimate discussions we are made privy to. Screening before Seoul Searching, Drama is my pick of the bunch of the shorts screening at Asia House Film Festival 2016. This is an elegant and evocative film which challenges us to think about the way cinema operates. Panchagavya is, in no uncertain terms, a delight. 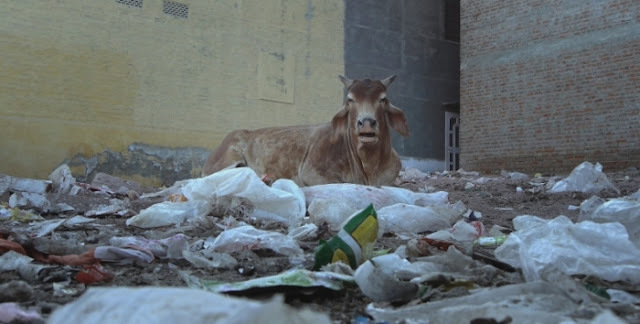 Over the course of the movie's running time, the camera lingers on a number of sights which appear peculiar to Western eyes - in the midst of the hustle and bustle of Indian city-life we see these humble beasts languidly roaming the streets, occasionally pausing to peer inside the shops around them or to eat rubbish off the floor. Here cows are as much, if not more, a part of the landscape as the people, the man-made buildings and cars which drive around them. This is a film which shows us what it is to observe beauty we may otherwise ignore - Panchagavya teaches us to use our eyes and our minds, to see from the perspective of cultures which are not our own. The serene narration by Shirya Pulgaonkar and warm score by Ronit Chaterji help create a movie in which we aren't just taken to another part of the world, but made to feel what it is to see through the eyes of others. We're placed in position of the Hindus who look at these magnificent creatures and sees "a beloved member of the family" staring back - our hearts are warmed by the gaze we receive. Yet, sadly, this isn't a love story which ends happily - as the cow's graze in the street, there are health consequences for the beasts and society too. Screening before The Monk, Panchagavya is a swift, albeit serene, fifteen minutes long. A lovely, transportational short well worth going out of your way to see. This screening constitutes the short's European premiere. 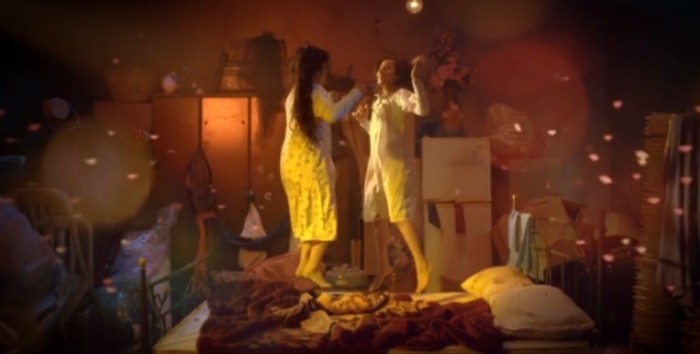 The final film from today's round-up is a short Saudi Arabian/UAE movie receiving its London premiere. It is also, by some distance, the most unconventional of the three selections. With Time, directed by Malak Quota, is a heavily stylised short which blends fantasy and reality, animation with live action. It regales a story, inspired by true events, of two sisters locked away from society in a small, impenetrable space. Whilst the thematically similar, awe-inspiring Room tells a tale which is as much about discovering the light and wonder in the universe, With Time deals more specifically with the coping mechanisms one uses in a nightmarish situation. In this sense, the movie is situated as much in the sisters' young minds as it is in reality - their imaginations take them to twilight worlds of fantasy battling the mundane. Quota uses an array of differing animation styles and techniques to bring his short to life - hand-drawn cut-outs remind one of Michel Gondry's retro aesthetics whilst CG brings terrifying monsters to the screens. Its an impressive mix of styles which add to an abstract feel for a short which, although occasionally lacking in coherence, keeps us gripped with visual invention. The short screens before The Case of Hana and Alice on February 27. Please keep checking back for more reviews from the festival and, if you're in London, don't forget to pick your tickets ASAP.